It is finally that time of the year when I get excited! I love fall. If you haven’t yet, you should check out my post about why we enjoy fall and our 2017 fall bucket list. As usual, part of my excitement comes from decorating. I’m a Pinterestaholic. I’m always looking at new ways to decorate things in the house or the yard. I especially like looking at fall, Halloween, and Christmas decorations. 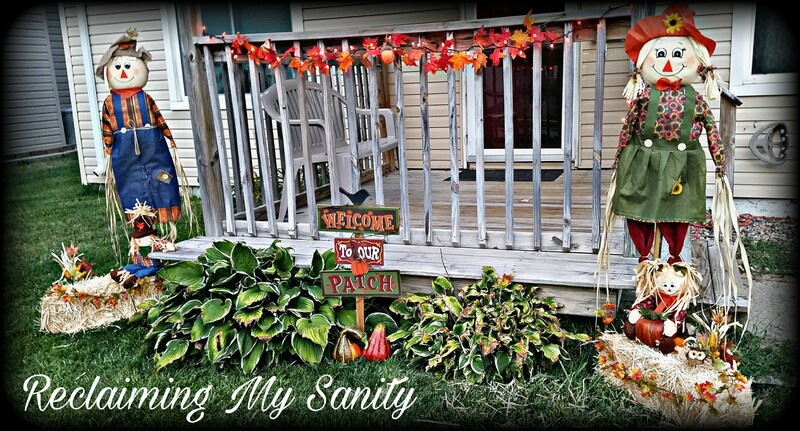 We recently put up our fall decorations, in the house and outside. (If you’d like me to do a post about the inside let me know). I had found a pin on Pinterest that I liked and I knew it wouldn’t be that difficult to recreate. We went to Michael’s craft store. They were having everything Fall related on sale! It was one of those shopping trips where I wanted to buy everything! They had a Halloween village display, to which I thought it would be cool to have a room in the house dedicated to villages (ok it is a little obsessive). Pickle, of course, wanted all the Halloween stuff; pumpkins, skeletons, you name it, and he wanted it. I think he loves this time of the year as much as I do. He likes to help decorate with me. Getting back on track here, we were at Michael’s. We knew what we were looking for and found those things. I am easily distracted and can spend a lot of time browsing all the decorations. My husband was trying to get me to the checkout before we went overboard. Got to love him! So, we paid for our items and loaded up the van. Made a pit stop to Wal-Mart, for medicine for Pickle’ s cough, and headed home. I couldn’t wait any longer. We got home and I pulled out all the fall yard stuff. Here is what we ended up with. If you are a details person, like myself, you will see 4 scarecrows. One representing each of us; the dad, the mom, the boy, and the girl. I think it turned out really cute! We are planning on adding real pumpkins when they get them in. After decorating, I came inside and we were just hanging out. It was Husker game day, but I am not that big of a fan nor do we have cable to watch it. Anyway, a couple of hours went by when all of a sudden Kona starts growling and barking like there is danger approaching. Much like a baby’s cry, I can decipher my dog’s bark. I knew something was bothering him greatly to where he thought we needed warning. I looked out the window and saw the scarecrow had fell over. This silly dog was barking at the scarecrow! 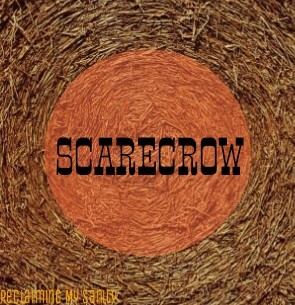 I guess that means the scarecrow is doing it’s job ha-ha. At least I know my dog will always warn me when he notices something out of the ordinary. He’s my burglary alarm system.